Mailchimp for Magento is a free integration that adds your customers and their order information to your Mailchimp list. Use Magento purchase data to send targeted campaigns with product recommendations, and turn on e-commerce tracking to measure campaign ROI. In this article, you'll learn how to connect or disconnect Mailchimp for Magento. To view the e-commerce features supported by this integration, visit the Magento listing in your account. If you're already using MageMonkey, you must uninstall MageMonkey before you can use Mailchimp for Magento. This is an advanced feature that requires experience editing Magento's root directory. Contact your Magento expert or developer for assistance. Mailchimp for Magento does not support custom, bundled, grouped, or gift card product types. Back up your server files and database before you install this integration. We also recommend you install it on a test server first. Mailchimp for Magento is compatible with these versions of Magento: CE v1.7.x, CE v1.8.x, CE v1.9.x, EE v1.10.x, EE v1.11.x, EE v1.12.x, EE v1.13.x, and EE v1.14.x. 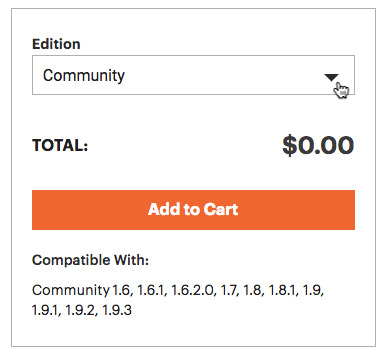 Our Abandoned Cart automation is only compatible with Mailchimp for Magento version 1.06 or later. Our Order Notifications automation is only compatible with Mailchimp for Magento version 1.1.5 or later. If you decide to use this automation, make sure to disable your Sales Emails in Magento to avoid sending duplicate emails to your customers. 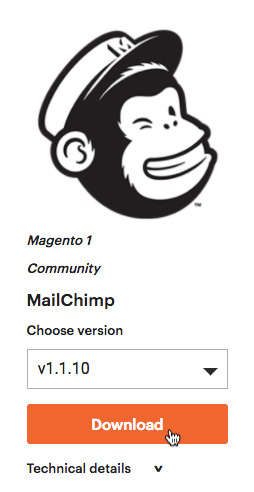 Version 1.1.1 of Mailchimp for Magento supports Mandrill for Magento. To use this feature, install or update to version 1.1.1 or later. Version 1.1.6 of Mailchimp for Magento adds support for multiple stores. Here's a brief overview of the multi-step installation process. Download the Mailchimp for Magento file extension from the Magento Marketplace. Upload the contents of the file to your Magento store root directory, and flush the Magento cache. 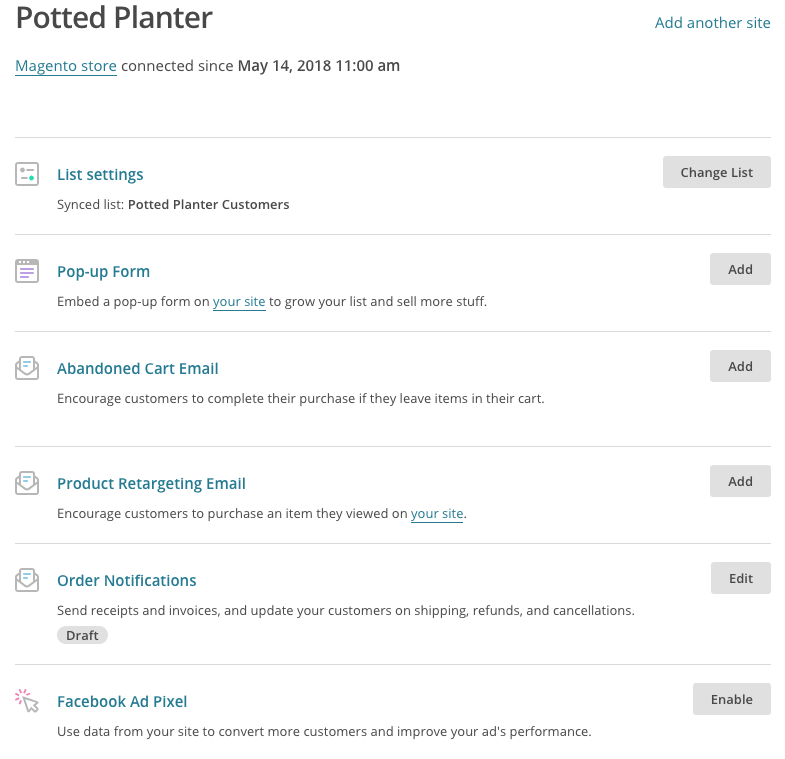 Configure Mailchimp for Magento, and connect to your Mailchimp account. To get started, you'll download the Mailchimp for Magento file extension from Magento's Marketplace. To access the free Mailchimp for Magento file extension, follow these steps. Navigate to the Mailchimp for Magento page. Click the Edition drop-down menu, and choose your version of Magento. Click the Cart icon in the upper-right corner. 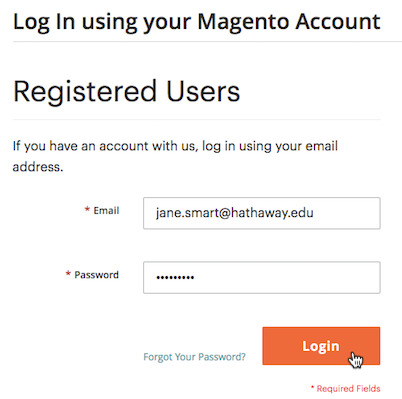 Input your Magento account login credentials and click Login. Click Place Order. Don't worry. You won't actually be charged. On the My Downloads | Extensions page, click Download. The file will automatically download to your computer. Next, you'll use it to install Mailchimp for Magento. To install Mailchimp for Magento, you’ll upload the contents of the ZIP file to your Magento store root directory, and flush the Magento cache. If you need help with this, contact your developer or Magento expert. Refer to this chart to see where the ZIP download files should go in your Magento root directory. After you update the root directory, flush the Magento cache. To flush your Magento Cache, follow these steps. 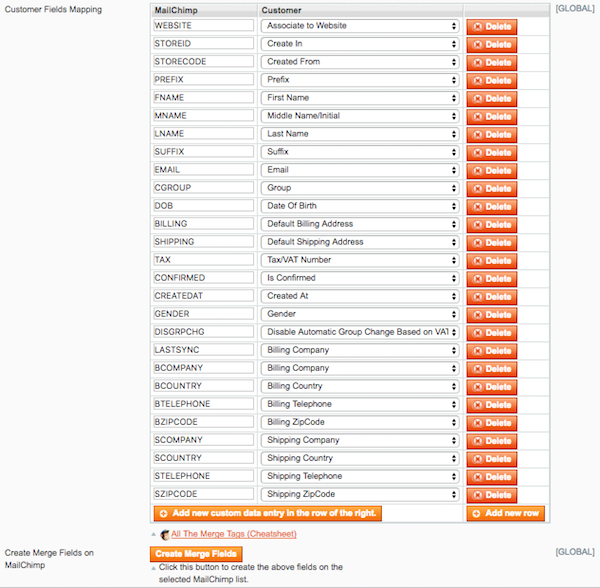 In your Magento Admin Panel, click the System menu, and choose Cache Management. Almost there! Next, you'll configure your Mailchimp for Magento settings, and complete this process. To wrap up, you'll configure your Mailchimp for Magento settings, like how and where to sync your customers to Mailchimp. You can set a default configuration, or configure your settings on a store by store basis. To configure and connect to Mailchimp, follow these steps. 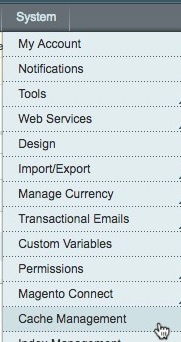 In your Magento Admin Panel, click the System menu, and choose Configuration. In the left navigation pane, click Mailchimp Configuration. Leave the form fields blank for now, and click Get API credentials. In the pop-up window, input your Mailchimp login credentials and click Log In. In the pop-up window, highlight the API key and copy it to a text editor or your clipboard, so you can paste it to Magento. Close the pop-up window to return to the configuration screen. 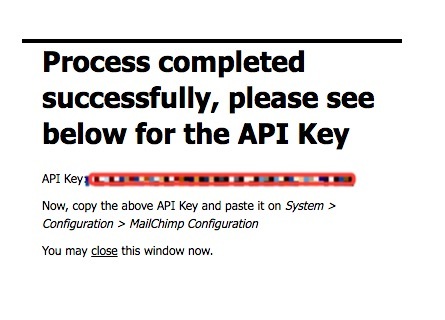 Paste your Mailchimp API key in the API Key field. When the page reloads, click the General Subscription drop-down menu and choose the Mailchimp list to sync with Magento. Next, edit or create merge fields to send Magento-specific information to Mailchimp. In the Ecommerce section, click the drop-down menu next to Enabled and choose Yes to enable Mailchimp's e-commerce features. Click the drop-down menu next to Subscribe all customers to the newsletter, and choose No. We recommend this setting for a permission-based list. In the Abandoned Cart section, click Yes to enable Mailchimp's abandoned cart automation feature. In the First date field of the Abandoned Cart section, choose the date that you want to begin targeting abandoned carts. To finalize the sync between Mailchimp and Magento, you'll need to set up cron job tasks. If you need help, contact your developer or Magento expert. Mailchimp and Magento are now connected. Magento customers will be added your list, and e-commerce data will be added to Mailchimp's subscriber profiles. Guest checkouts will be added to the Transactional section of your list. Products, customers, and orders will be sent to Mailchimp approximately every five minutes via a cron job. 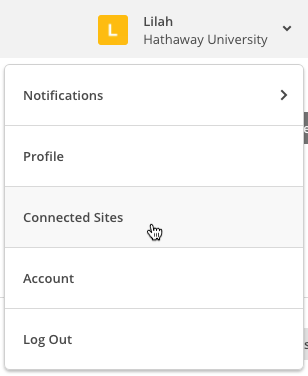 After you install Mailchimp for Magento, you can visit the Connected Sites page in your account and view details for your connected store. Here, you can see the status of the integration or add and manage e-commerce features. From here, you'll be able to view your synced list, embed a pop-up signup form on your site, or add and monitor e-commerce automations that use data from your connected Magento store. To change the Mailchimp list synced with Magento, you'll need to return to your Magento Admin Panel. It's important to note that If you change your synced list, the integration will recreate your store in your Mailchimp account and you'll need to recreate any active automations connected to your store. To change your synced list, follow these steps. In the left navigation menu, under MAILCHIMP, click Mailchimp. In the pop-up window, click OK.
Click the General Subscription drop-down menu, and choose the list you want to sync with Magento. If you want to send transactional emails with Mandrill, you can connect Mailchimp for Magento to your Mandrill account. To connect to Mandrill, follow these steps. In the left navigation menu, under MAILCHIMP, click Mandrill Configuration. 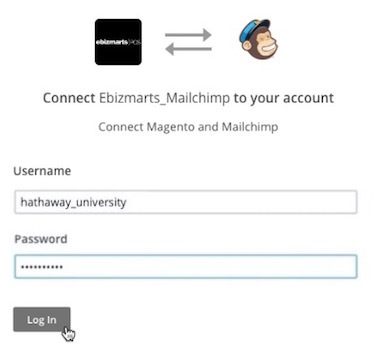 Click the Mandrill Integration by ebizmarts bar to expand the configuration options. Click the Enabled drop-down menu, and choose Yes. Enter a valid Mandrill API key, and choose whether you want to Enable Log. Nice job! You should see a success message, as well as Account Info statistics about your username, reputation, hourly quota, and backlog. After you connect, you can do a lot with the the data you collect, like build segments, send automations, track purchases, make product recommendations, and view results. For help with the Mailchimp for Magento data sync, visit ebizmarts' Mailchimp for Magento support forum. If you need assistance with Mailchimp, visit our Knowledge Base or contact Support. If you need to disconnect the integration, you can disable it in Magento at any time. To disable the integration, follow these steps. Click Mailchimp Configuration in the left navigation pane. Click the Enabled drop-down menu, and choose No. To learn how to remove the integration entirely, visit ebizmarts' Mailchimp for Magento support forum. Learn how to set up Mailchimp for Magento 2. Add customer data from your Magento store to a Mailchimp list, automate abandoned cart emails, and more.